CYCYING DESIGNS LLC has been awarded a United States and International patent design, (D) 393, 445. The world's first design bicycle cover provides cyclist with a unique one piece cover that protect while transporting, storing or parking bicycle. NEW Design COVERS are relatively simple and easy to install. CUCKOO COVERS AERODYNAMIC FIT provides protection from the elements, such as bugs rain, stones, sand, beach salt, sun-rays, dust and ice snow. CUCKOO COVERS provide protection from theft of bicycle's components while transporting bike on vehicle carrier rack. ​Stretchable fabric repels water and debris away from bicycle's components, while allowing crosswinds to flow around cover, when transporting coved bike. 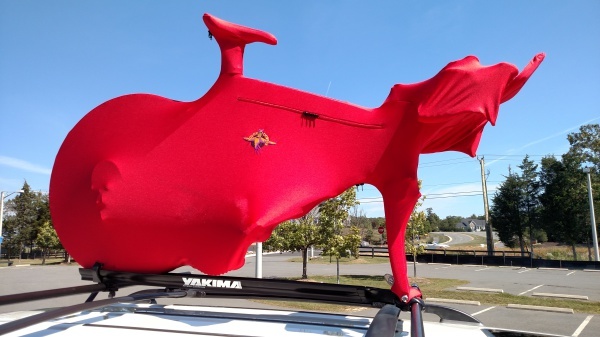 CUCKOO COVERS recommend FORK-MOUNT cover for vehiche ROOF-CARRIER- RACKS & WHEEL-MOUNT cover for REAR-CARRIER-RACKS. 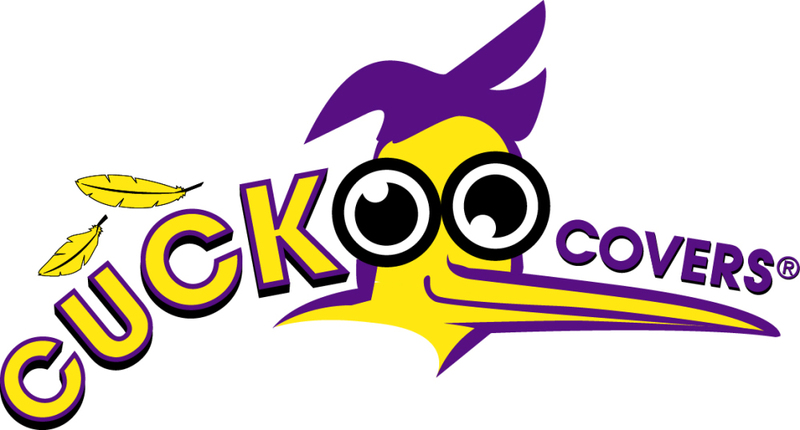 CUCKOO BICYCLE COVERS have been rated to the legal speed limits of 100km/h or 65mph. CUCKOO COVERS recommends that users follow manufacturer's Roof-Rack carrier guidelines when transporting or installing bicycle. 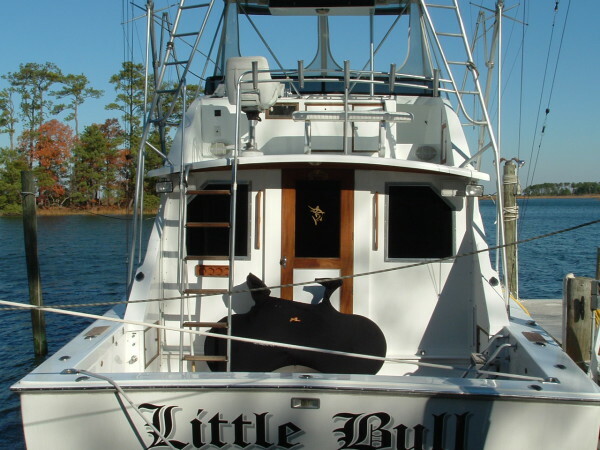 CUCKOO COVERS maximum load rating with Roof-Rack-Carrier with crosswinds is 165lb. 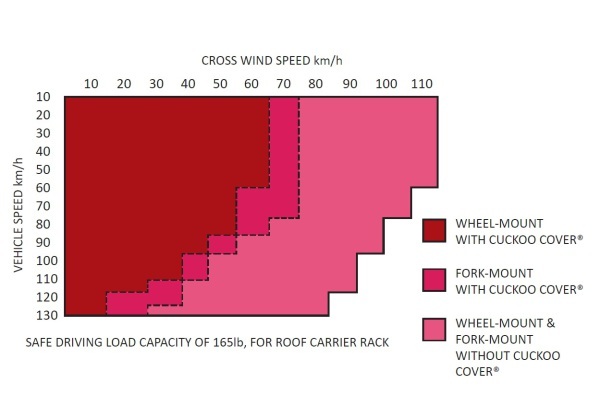 The following graph outline the vehicle safe driving speeds with crosswinds, for Roof-Rack-Carrier with a maximum load rating of 165lb. A unique COVER design allows you to mount the bicycle with one or two persons, for example RECUMBENT or TANDEM style bikes. CUCKOO COVERS fits all style roof & rear carrier racks. We recommends that users follow manufactuer's carrier rack guidelines when transporting or installing bicycle with Cuckoo Cover. Never block vehicle's rear view or rear lighting when transporting bike with Cuckoo Covers.